Richmond Rosies Rule: How We Went About Breaking a Guinness World Record – Where's JWo? 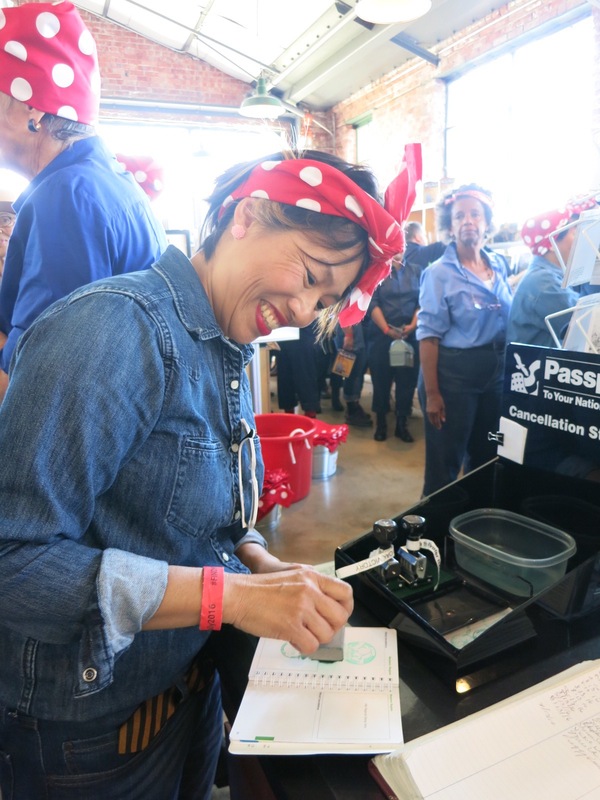 Last Saturday morning, my old friend Juliet aka Geocache Whisperer and I joined over 2,000 Rosie the Riveter lookalikes in Richmond, CA to break the Guinness World Record set in 2015 at the Willow Run Bomber Plant in Michigan. I was very excited to participate because my friends and I always dreamed of getting into the Guinness Book of Records when we were kids. Now was my chance to make it happen! 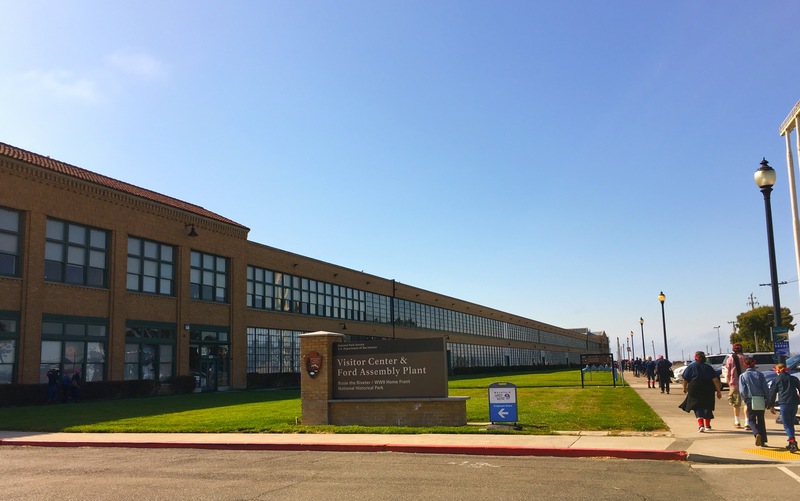 The Rosie the Riveter/WWII Home Front National Historical Park was established in Richmond in 2000. This park pays tribute to the rich history of the city and its contributions to the war effort while at the same time highlighting the roles that women and minorities played in securing a victory for the United States in World War II. Because most able bodied men were away at war, there was a shortage of workers on the home front. The United States Government started actively recruiting women to work in the military industry, asking them to take on jobs traditionally held by men. These women faced gender discrimination in the forms of unequal pay and harassment but carried on despite these obstacles and not only helped the war effort, but proved that women could do a man’s job just as well as he could. Since many women working in the defense industry were riveters, Rosie the Riveter, with her catchphrase “We can do it!” was created to symbolize women who had joined the workforce during this time. Not only did these Rosies help the Richmond Kaiser shipyards make history by producing 747 ships for the war, more than any other shipyard during this period, they were the catalysts of the modern women’s rights movement. Without a Rosie, there may not have been a Hillary. It was at Craneway Pavilion, a former Ford assembly plant used as a tank depot during the war, where we all gathered to make history again. 2,265 men, women and children, all dressed in dark blue shirts, dark blue pants, and red socks with a red and white polka dotted bandana tied around our heads showed up to be counted by Guinness. I can proudly say we successfully broke the previous record set by 2,096 Rosies in Michigan. To make the day even more special, I had the privilege of being in the same room as some of the original Rosies, many of whom are now in their mid to late 90’s! What an incredible life journey it must have been for them. 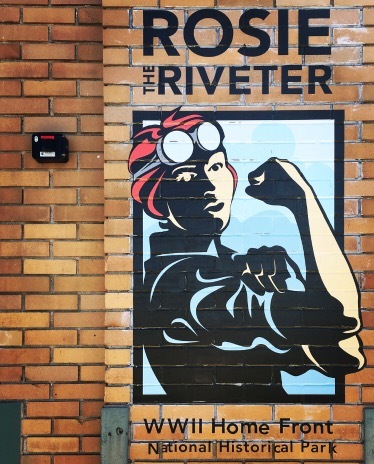 For a wonderful and informative history of Rosie the Riveter and how Richmond went from a sleepy town of 23,000 to a boomtown of 100,000 during the war years, stop by the visitor center located at 1414 Harbour Way South. Make sure you bring your National Parks Passport. If you don’t have one, you can pick one up in the gift shop. 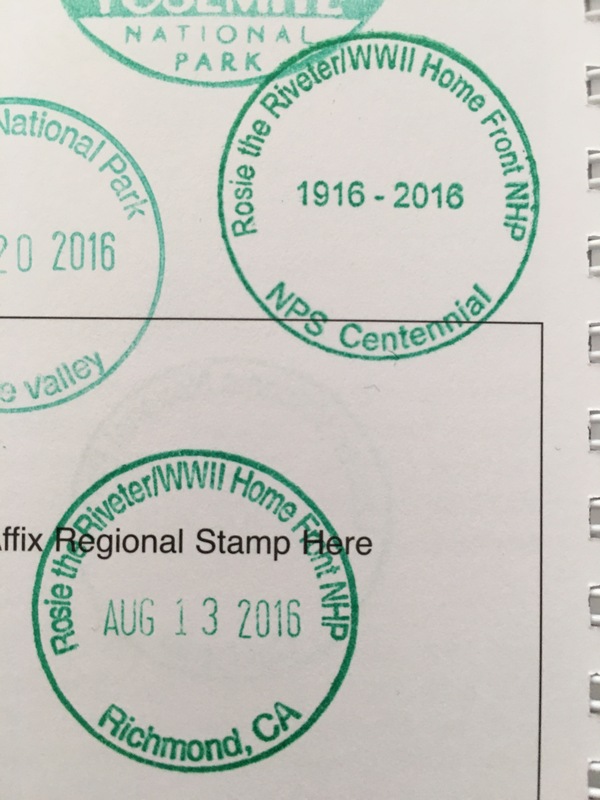 It will be worth it because the parks have a bonus centennial stamp this year to celebrate 100 years of the National Park Service! Just outside the visitor center is an easily accessible geocache GC3WNYJ (Rosie the Riveter NHP Permanent Visitor Center). After your find, take your time to enjoy the views of the bay and San Francisco. A little ways down the Richmond Marina Bay Trail you will find the Rosie the Riveter Memorial. Answer one easy question and you will get credit for the virtual cache GCCA46 (Bay Area History – Rosie) here. For information about how you can support this local treasure please contact the Rosie the Riveter Trust. One word…. no, two words: so cool!!!!!! Congratulations! So cool that I can now say I know two people that broke a Guinness world record!